We shortlisted top 6 snowboard gloves with wrist protection for in-depth analysis and review. After 9 hours of intensive research, we can confidently say that the Level Fly Trigger Snowboard Gloves with Wrist Guards are the best of the lot. They are warm, water-resistant and truly shine in terms of performance. Pick the Seirus Innovation 1208 Skelton Winter Cold Weather Unisex Glove starting at just around 40 dollars if affordability is your key concern. 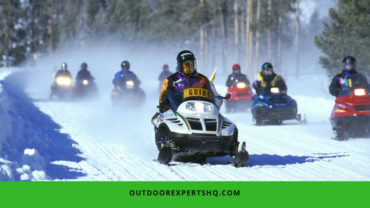 They will not let you down this winter when you are too busy shredding the powder around the slopes. Bad gloves are not your friend especially when you plan on snowboarding the holidays away. Pick the right fit, style and properly protected pair of gloves that you can count on in these unforgiving chilly winters. Scroll down to know the key points you need to take care while picking a pair for yourself. Now, this feature need not be pondered over a lot. Just keep in mind that your jacket of choice and your final selection should complement each other. You have the main options of over the cuff and under the cuff in this case. The main motive of the cuff length is to prevent the ice or wind from penetrating your jacket and gloves. With over the cuff style, you get better protection against the snow. They can just go over your jacket sleeve and provide you double protection against the icy winds. Under the cuff style work best with jackets that posses velcro adjustment tabs. This way, you get better mobility and grip on your snowboarding gear. The removable ones are the best kind of wrist guards. You can put them and shield yourself from all kinds of cold-related troubles whenever you want. And when you don’t need them, just take them out and enjoy better and gentler grip on things. Being able to remove them allows you to wash them separately and in a more thorough manner. You can use your snowboarding gloves on a normal winter day away from the slopes also this way without looking like the unofficial ambassador of the ‘Funtown’. It is easier to use them for both casual and sporty events this way. You can add more warmth and comfort to your gloves with the help of a lining. They can be removable or non-removable in nature. It will also help if you carry two different kinds of lined gloves if you are planning to ski or travel around varying temperatures later on. The synthetic lining makes it possible to keep the fabric clean and dry at all times by wicking off moisture and sweat as soon as it appears. You can get an additional pair of lining too for replacing the dirty one and still have enough lining option for warmth and protection. The fit is very important when you are planning to use them while performing gravity-defying snowboarding tricks. They need to be snug but still have enough space to accommodate your inner gloves to ensure proper protection against the sub-zero temperature conditions. The removable wrist protection must be firmly attached to your gloves when in use. This should not compromise the flexibility of your gloves. Your hands need the freedom to guide you through the snowboard as you glide from one slope to another. You can alternate between the trigger mitten, gloves and the normal mittens with wrist protection to make a better choice. A good pair of insulated gloves can add all the more joy to your ski trip. You don’t need to worry about freezing your hand off anymore in the chilly winters. If you have made the right choice then you will be enjoying a good fit and free movement throughout the journey. The thickness of your gloves is not directly proportional to the level of insulation it offers from the biting cold. Down is one of the insulation options that always works. It is a combination of down plumules and feathers. The only downside to it is that if you get it wet, it becomes an uphill battle to get it dry quickly. These are few of the many factors that will help you to make a smart choice when it comes to buying snowboarding gloves. We have put together a list of six main snowboarding gloves out of the numerous options that are present in the market. Read on to know about them in detail. These gloves are getting a good response from the global audience for their affordable price with top-notch quality. Starting in the 40 dollars range, they have incorporated a number of desirable features in their built including removable wrist protection, extra padding, and durable fabric. Specially built for the snowboarding season to prevent all kinds of injuries. The highly waterproof and breathable fabric – DryHand Insert – comes with the 200g thermolite insulation. The one-handed wrist and cuff along with the Gauntlet Cuff keep the cold out with the help of drawstrings. Some customers are complaining about poor quality stitching and durability issues. The gloves are known to be lightweight and stylish being available in a variety of colors. You can get one for yourself for just about 50 dollars. The attention to detail of the manufacturer is noticeable in the overall design of the gloves and the helpful features. The full length over the cuff gauntlet offers maximum protection from cold and impact at all times. Comes with a fixed liner to keep your hands warm and toasty throughout the day. Customizable loop and hook wrist support will keep the injuries at bay. Its size chart might be a bit misleading so try them on before buying a pair for yourself. These gloves have been designed with an emphasis in preventing the wrist injury by offering better support through the innovative glove layout. You can get one for yourself or a near and dear one easily considering its affordable price tag of approximately 55 dollars. The shell is made up to 100 percent nylon with 100 percent PVC palm patches. You get a better grip and a sturdy shell with its anti-slip palms patches and Duraplex shell. These gloves can be found in a wide range of sizes making them ideal for both small and big hands. The elastic pull string on the velcro wristband might give up sooner than the rest of the glove. Affordability, quality, and innovation lie at the core of Level Fly Trigger Snowboard Gloves with Wrist Guards. Their strong exterior shell gives you the protection of a glove with the warm insulation of a mitten. Currently, you can get one for just about 95 dollars. Exterior shell is made up of Membra-Therm Plus to offer better breathability, protection and durability. You get the removable fleece liner to add additional warmth whenever required. Extra protection from the wrist injuries with the help of BioMex wrist guards. The rates and policies might change a bit for getting it shipped outside America. The gloves excel at combining good grip and unbeatable protection with the help of removable backhand and palm rigid nylon plates. They minimize the impact of a thundering wipeout on your wrist along with canceling out the impact of the range of motion. Its shell is made up of a poly/nylon blend with DWR (Durable Water Repellent) Treatment for maximum strength. 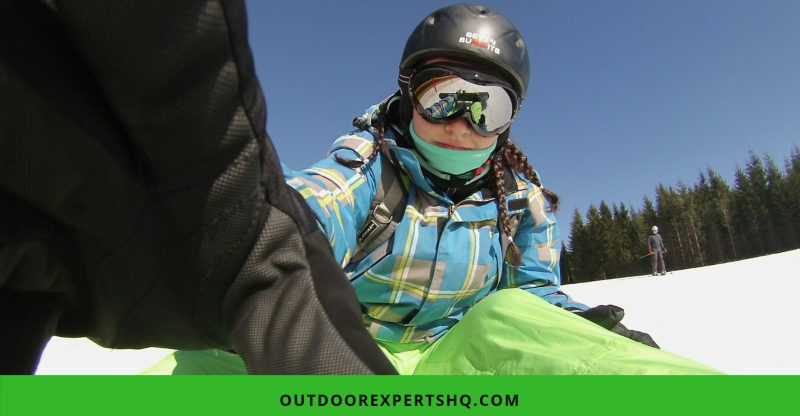 The high loft synthetic insulation makes it all the more suitable for snowboarding when even the sun hesitates to come out. You enjoy the dry and warm feeling all day with the help of the accompanying DK DRY waterproof insert. These gloves might not be as warm and cozy as they have been advertised to be. You will get the most out of these gloves if you are a beginner or intermediate lever snowboarder. The BioMex wrist protection system keeps you safe and going at all the highs and lows of the slopes without any trouble. Try them out if you want at somewhere around 95 dollars. The fingertips and palms have been Kevlar-reinforced on these gloves for better protection and warmth. Removable fleece liners let you lighten up the load when you want to charge full speed ahead. The glove fingertips are styled like boxes to maintain proper circulation through your fingers and keep them warm while having your gloves on. You get fewer color options with these gloves and their price might require you to save up a bit if you absolutely need to have them. A few of the recent features are taking the market by storm. You might want to try or at least know about them before making your next purchase. Don’t let the chilly winters turn you into Rudolf, the red-nosed reindeer, this season. Instead, take full benefit of the latest nose wipe feature. This nose wipe is usually present in the form of a patch on the outer surface of your glove’s thumb. Soft and absorbent material such as the Ultrasuede is used for this patch which is the next best thing after a Kleenex. Fingerless gloves for the gym and bike-riding purposes exist for a reason. Aside from obviously looking ultra-cool, they offer the same level of grip that you enjoy without the hard glove fabric interfering with your grasp. But, you can’t use them for snowboarding unless you are cool with letting you fingers freeze and fall off. The Articulated Fingers present in the latest range of gloves help you retain ultimate grip without losing one or all of your fingers in the process from frostbite. Sometimes it is the little details that make you really pleased with your purchase. Take the Mini Squeegee for example. When you are having a speeding contest with the untamed winds and suddenly your goggles decide to get fogged up leaving you completely disoriented. What do you do then? Well, you can go back in time and get a snowboard glove that comes with the Mini Squeegee feature! Sewn onto the thumb of your glove, it is practically impossible to lose it no matter how forgetful you get that day. Do you snowboard in breaks because you can’t seem to keep your gloves on? Is it getting really annoying and you can’t wait to upgrade to a better option? Well, just go for one with the wrist and cuff closure system next time. You could have them already if you did a bit of research before buying your current pair. Well, its never too late. Or something like that! The adjustable velcro strap or the zipper will help you keep the gloves in place no matter how fast you decide to go. Keep an eye out for these features if you are planning to buy a new pair for yourself soon. Remember, its good to try new things sometime! There is nothing better than snowboarding till you start feeling invincible. Rekindle the joys and memories of the good old days this season by bracing yourself up with the snowboarding gloves. We suggest the Level Fly Trigger Snowboard Gloves with Wrist Guards for getting the good worth of each penny you choose to spend on it. What kind of snowboard gloves do you prefer? Are you planning to be fully prepared this season and get an additional pair just in case? Let us know about your plans, queries and everything else in the comment section below. In the meantime, forward it to your friends and family if you are not too keen on lending your new ones to them just out of sheer decency!